Some parents will use the first birthday as an opportunity to host a large gathering with friends and relatives of all ages. Others will make it a quiet celebration share with very close relatives. Either way, your baby will be completely unaware of his or her accomplishment, and will only enjoy it way off in the future while reviewing the old photo albums. So, make it a party the grownups will enjoy while taking into account your baby's comfort and schedule. Your baby is on the verge of taking those first little baby steps if he or she hasn't already. Let those tentative little baby steps provide the theme for your party. Schedule the party time around your baby's nap schedule. There's nothing sadder than an unhappy guest of honor. Take plenty of pictures for your baby's photo album or scrapbook. If there are older children at the party, get them involved by allowing them to help open the presents. Your baby won't care about much more than the wrapping paper anyway! Most babies haven't had much experience with table food at this point, especially with dessert, so don't forget to photograph your baby as he or she dives into that first slice of birthday cake. The reaction to this cake will probably be one of the funniest you'll ever record. If young children will be at the party, it would be a nice gesture to distribute goody bags because, aside from the cake, that's the one thing children become most excited about at parties. Appropriate items to include for very young children are animal crackers, crayons, board books, and balls. If you plan to have balloons at the party, Mylar balloons are your safest bet. Regular latex balloons pose a choking hazard to the children. Use it as a template to create invitations that have either been cut out in the shape of a baby foot or drawn on card stock. or drawn on card stock. Create a sponge in the shape of a baby foot using the cookie cutter, and use it to stamp foot designs on a plain white tablecloth. Place the cookie cutter on top of your finished and frosted cake and fill it with decorator sugar to create a baby foot design on the cake. Prepare party favors for the adults using baby socks filled with candy. Tie them closed with a ribbon. Attach a photo of the birthday baby on the other end of the ribbon after punching a small hole in a corner of the photo. Create a small photo gallery of baby's first year in the party room so that everyone can admire those cute infant moments. Pasta Shells with Feta and Herbs - This delicious recipe is an interesting twist on a classic dish and can be prepared in advance. Glazed Carrots - You'll need to double this recipe for a party of 8. 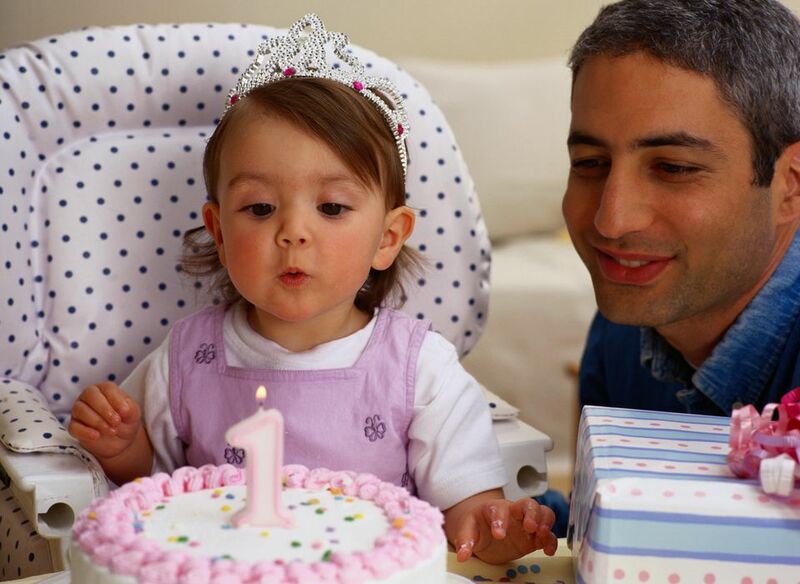 Birthday Cake - Use a white frosting to best show off your baby steps decoration. Champagne for toasting baby and the proud parents. Soft drinks, coffee, and tea.